Seattle-based architecture firm specializing in zoo design. Over the weekend, a video taken at the Henry Doorly Zoo in Omaha, Nebraska, hit the internet and is getting a lot of play. It shows a family in a building with glass viewing, watching a troop of gorillas. A gorilla charges the window, jumps, and hits the window with his foot, breaking the glass. 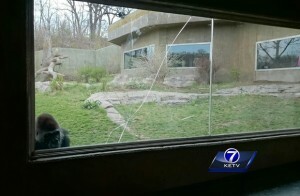 As I watched this, like all good zoo designers, I noticed how the glass cracked and not so much the reaction of the people. The glass shattered with long cracks running from the point of impact. This told me something about the type of glass used and I wondered why the architect specified this glass. The glass broke with shards of pointy glass. This is typical of annealed glass. Tempered glass, like that in your car, shatters into many small pieces. Tempered glass, also called safety glass, is commonly used in high traffic areas. At PJA we only specify tempered glass in all our viewing areas for the safety of the animal and also the viewing public. Having shards of sharp, pointy glass in the vicinity of a wild animal can result in injury to that animal or the guest. Both types of glass viewing windows are typically laminated with two to four layers of glass, so when one pane breaks, the structural integrity is not compromised. The only reason I can think of for using annealed glass is because it is cheaper. That is the only benefit that I see. As the cost of zoo exhibits increase, we all try to find ways of bringing them into budget. Viewing glass is very expensive and I can understand why some zoos choose to use annealed versus tempered when the project is over budget. I feel this is very short-sighted and every effort should be made to find cost savings in other areas. I am not questioning whether the selection of annealed glass is right or wrong, as I do not know the circumstances for which it was selected. All I am trying to do is point out that small details can make a big difference. Lately, we have been asked to find better solutions to viewing glass that will cut down on light reflection and also bird strikes. We have found different types of glass that will do one or the other but not both. If anyone has a suggestion I would love to hear it. Please post to this blog! Below are examples of the two type of glass, both broken by gorillas. This may help you understand the difference between the two. Tempered glass on the right and annealed glass on the left. I do not have much knowledge about different types of glass to be used in zoo design, but this article triggered an idea. I work at an eyeglass store and we have technology that we add to the lenses called transitions; which basically means once you are receiving any form of UV rays the lens begins to darken comparable to as much sun you are receiving. What i have noticed is that I can see perfectly well when they are pitch black, but others can barely see my eyes. I feel that would be a good way to allow viewers to see out but not cause to much attention. so that animals remain in there normal state without being stirred up by being watched. 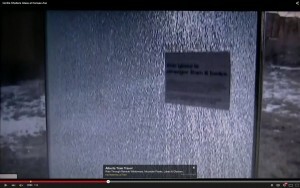 As for glare and light issues perhaps Anti reflective coating.